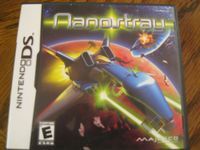 "Nanostray is a vertical scrolling shooter video game for the Nintendo DS. Similar to many games in the genre, the user takes control of a futuristic spacecraft against a seemingly endless horde of enemies. A sequel to the game exists entitled Nanostray 2. Basic gameplay consists of first defeating waves of many small enemies and then larger, stronger enemies. When all enemies in a wave are destroyed, a blue powerup that restores the power weapon bar is released. Enemies can also release coins when destroyed, worth some points. At the end of each level there is a boss that represents the theme of the level. The game has three difficulty settings; Normal, Advanced and Expert. Each progressive level diminishes the amount of lives, energy, continues and amount of smart bombs replenished after the player loses a life. The Nintendo DS touch screen is used for boss scanning, radar and weapon management." Source: Wikipedia, "Nanostray," available under the CC-BY-SA License.